But it wasn’t just the city’s beauty that enticed Pat and her husband Rich to leave the high costs of Austin, Texas, behind and move to Granada. Its affordability attracted them as well. 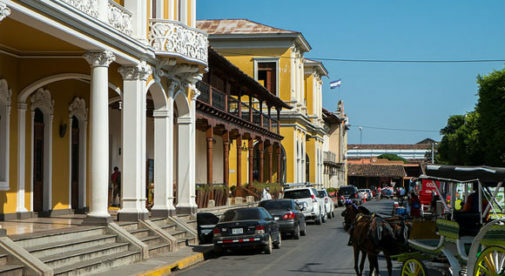 Lying on the shores of Lake Nicaragua, Granada exudes colonial charm. The ornate yellow and white cathedral is the centerpiece of the main plaza. By day, the nearby park comes alive, with local vendors selling homegrown cashews, freshly baked breads, ice-cold treats, and clothing. The cathedral also marks the entry onto the calzada, the city’s most popular street. Its cobblestone walkway, lined with bars and restaurants, is the perfect place to enjoy a cold beer or a rum with friends, while watching the sunset over the lake. For just $53,000, Pat and Rich bought a two-bedroom, two-bathroom home, with a loft they can use for storage or as an extra room. Their home features a large yard, with a bodega for additional storage, and sits just over a mile from the city center. 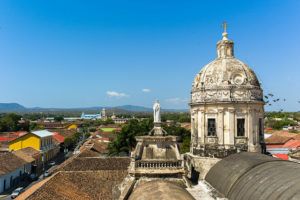 Pat and Rich fell in love with Granada, Nicaragua the moment they arrived. The couple grew up in Fair Lawn, New Jersey. Rich worked as a software engineer, a career that kept them moving around the States. Eventually, the two planted their feet in Austin and grew roots. But when the “Live Music Capital of the World” became too pricey, they began to look for greener pastures. The high-school sweethearts began thinking of retirement outside the U.S. while on their first visit to Granada. Through savvy investments, they managed to put enough money aside to retire at the young ages of 54 and 55—but only if they could find a place to live for less. They stumbled into a Friday-night expat mixer at a local restaurant and picked the brains of other expats, who later became their friends. Granada has a large expat community of people from all over the world. “It seemed like a good fit for us, with the right amount of expats, shopping, and ways to keep busy,” says Pat.